All the Daily Image mailings for the month of January 2011. We start year 6 with a shot taken over this past weekend. For the last 4 days we have had absolutely glorious winter weather with clear blue skies, bright sunshine, and temps in the 20s. As the former announcer for the Seattle baseball team was frequently heard to say, "MY OH MY! ", it just doesn't get any better. So off we went up along the North Cascades Highway (SR20) leaving home while the moon and Venus were the only things lighting the sky and returned to the same. Along the way we passed through Rockport, WA, and continued through Marblemount,WA up into the hills for some fantastic views of the Eldorado Mountains (part of the "American Alps"), frozen vegetation along partially falling streams, wonderful icicles, a wild herd of perhaps 35 Roosevelt Elk, and more than 60 Bald Eagles. And if that wasn't enough, we finished off the shooting with a side trip to Fir Island, WA for some lovely sunset images and an opportunity to watch the full flock of c10,000 Snow Geese lift off in unison a time or two plus a small show of maybe 300 Trumpeter Swans. Just couldn't ask for a much better day than that. Well, perhaps you could ask, but I don't think it would be realistic. I got enough material from that one day shoot to provide images for a couple of weeks, so lets start with a concluding shot just to be different. 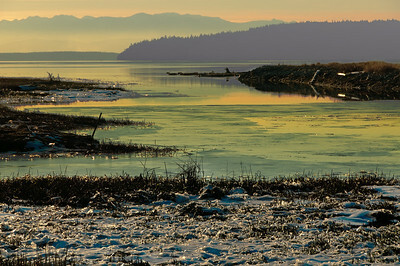 With the cold weather, snow that had fallen earlier was still clinging to whatever it could, and this made for our first exposure to it on the shoreline of Fir Island. With the winter sun rapidly sinking, that beautiful light, coupled with a bit of intentional underexposure, provided for some spectacular shots. This is one I really liked from the group. ISO 200; 1/640 sec @ f/ 11. Travel along I-5 N approximately 60 miles to the town of Burlington, WA at which point you exit and take SR20 E roughly 40 miles to the town of Rockport, WA. 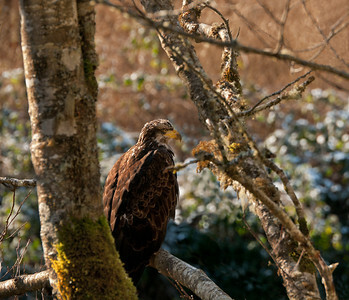 You are now in the heart of the Bald Eagle viewing area, which lasts for about three months peaking in the early part of December when the salmon spawn is at its height. As you might imagine, the congregation of birds tends to follow the salmon run. We made the visit about two weeks post peak, so there were still plenty of birds to see, and for those of you living near me there is still time to go see a lot of birds. However, should you wait too long, and miss the big bird display, you will simply have to spend your time looking at what remains behind after the birds depart. 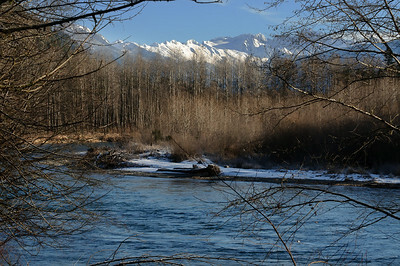 Assuming you make your visit on a somewhat sunny day, the local scenery isn't altogether that bad, but, should you desire something more, there is always an opportunity to go rafting down the Skagit River, visit a local salmon hatchery, do a bit of snow related activities, or just visit some of the local communities for some interesting sight seeing. The bottom line is that for a day trip it would be hard to find this anything other than relaxing, to the degree that you may not want to return to your place of origin. 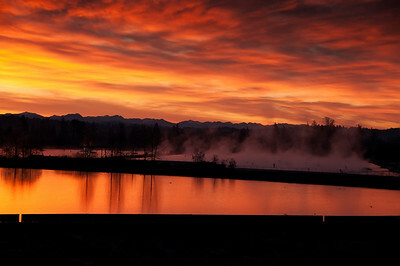 As an example, I submit this roadside view taken from the bridge across the Skagit River in Rockport. Oh yes, for those of you counting birds, try your luck with this image; yesterday's image had at least 13 that I can easily point out, there may be a few I missed. ISO 320; 1/ 800 sec @ f / 9. Driving slowly along SR20 E we came to a spot with a couple of cars stopped and I ventured out to see what I could find. There were a couple of birds noticeable in the distance sitting on a tree with others joining, eventually culminating in a total of four birds. Plus a few others way off in the distance that were really beyond any hope of capturing. I worked the closer birds until I felt I couldn't improve and then started back towards the vehicle. As I was walking back a slight movement caught the corner of my eye so I stopped to look more carefully and saw this young bird that was somewhat obstructed by both branches and sunlight. Moving around to better position myself I was able to get a few shots of the critter as it turned to look at me and then turned away again, repeating this behavior as I snapped away. None of the images were satisfactory by themselves, but with a little work on the computer I was able to get one that I think is acceptable. This bird is likely between 5 and 6 years old as you will note that the head feathers are just becoming white. One of the few Bald Eagles I've seen in this transitory period. ISO 320; 1/200 sec @ f / 8. Leaving the prime eagle area we drove further east through Marblemount and proceeded up the local mountain side leaving SR20E at the point. 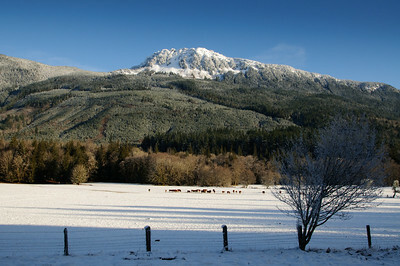 Just prior to crossing over the bridge that would take us to the Marblemount Fish Hatchery and the mountaintop, we stopped in a local church parking lot to take some images of the mountains from a clearing on the opposite side of the street. Walking back to the vehicle I noticed a number of frozen puddles in the gravel roadway leading to the clearing that was private property. I walked down that road as far as a visitors center assuming that using that portion of the road would be O.K. 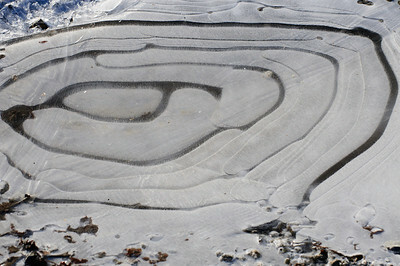 The puddles with the interesting ring-like designs on their surface were plentiful and I attempted to record several of them. I got them focused as best I could in some rather bright lighting conditions and, satisfied with the representation on the back of the camera, left to go up on the mountain. It wasn't until I got back home and looked at them carefully on the screen that I noticed there was more to the design than I had originally envisioned. Zoom in and look at the image carefully. ISO 200; 1/500 sec @ f / 10. There are two tricks to getting the images you desire: 1) being there when they occur, and 2) having the camera with you. How many times have you found yourself saying " insert your own choice of modifier, I wish I had my camera with me!" Now, if you've never said that either 1) you're the greatest photographer in history, 2) not a photographer, or 3) you're not being honest with yourself. There are of course at least three ways of fixing this problem which are either keeping your main DSLR with you at all times (not a bad idea), purchasing one of the smaller DSLRs like the Canon "G" series or Nikon "P" series, which will fit in your coat pocket or handbag, or getting one of the newer smart phones which take amazingly good images, and far better than none at all. Whichever approach you elect, you stand a reasonably good chance of getting that image, the degree of which will depend to some level on your talent. With the light constantly changing, you either take the image the moment you see it or accept that it will be roughly 22,000+ years until the light is falling on that same spot in exactly the same way. A bit too long a wait for most of us; or at least for those with whom I'm familiar. So we either get the image when we see it or miss it; the familiar "you can go back and get it later" just doesn't happen. For example, here is the sky roughly 2 minutes after I took the shot I shared yesterday. In both instances, it was get it now or forever wish you had. ISO 320; 1/40 sec @ f / 6.3 hand held in 24ºF temp. Just to set the tone for today's image I'll warn you that it will take some sleuthing to see that about which I'm writing. For a moment, think about all the outdoor shows/movies you've ever seen that featured water droplets falling off something like an icicle or frozen anything and you have the topic for today. While we were driving along the mountainside outside of Marblemount, we passed several small and lovely waterfalls, most of which were nothing more than water falling over an embankment and splashing below at the roadside. But occasionally we came across water spilling over some large rocks which in the process had formed some very pretty icicles. With the sun shining directly on them, even in 27º F temps, the icicles were dripping and the droplets of water falling to the pools below. Jan wanted me to try and capture the falling drops, so I set the camera to shoot as fast as I could and made a few feeble attempts. This one actually captured two different droplets and as I like to rock formation behind the water in both forms, thought I'd share it. 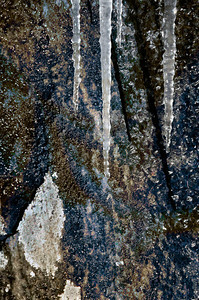 Look closely at the very bottom of the image at six o'clock for one of the droplets, and diagonally upward to the bottom of the section of white rock for the other. Both are blurred, but as they are refracting the light you will see a bit of a color spectrum in them. ISO 200; 1/250 sec @ f / 10. Driving along SR20 you encounter bend in the road after bend in the road of constantly recurring beauty. 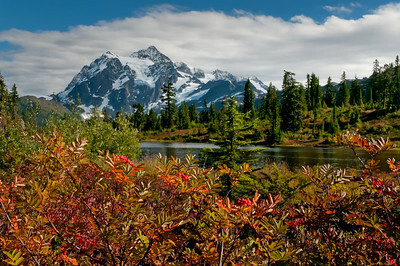 During anytime of the year it is a lovely day trip, especially so in the fall while you can still drive the entire road of dramatic fall color and the winter where the frosted tops of the mountains offer one delight after another. Along the way you pass river and farm scenes that likely will remind you of material used by the masters as they painted their works of old. But it is all current stuff obviously which makes it even more enjoyable since it is literally in our backyard. It would be nice if I knew all the names of the peaks, but I don't, so while I can't share with you the names, I can share with you the faces. This shot was taken about 10 miles outside Rockport, WA as we were headed to the first [planned] stop for our Bald Eagle shoot a few days back. ISO 200; 1/500 sec @ f / 11. As I mentioned yesterday there is simply one beautiful scene after another as you traverse SR20; some of the pastoral settings along the way might almost make you want to become part of the landscape. During my first tour of duty I had commented to one of my enlisted troops "don't let then treat you like cattle" which he understood to be something along the lines of my thinking of them as cattle. There were some hard feelings until we got it all straightened out. But in looking at some of the settings in which I saw cattle along the drive, I couldn't help but think, to some small degree, that if what I was seeing was what it meant to be cattle, perhaps I wouldn't mind being treated in that manner for a while. The image I shared yesterday is simply the top of what is serving as the background for the image today. Image the tranquility provided by spending a few hours in a place such as this. And after a week like what I've just had, I'm thinking I'm ready to trade places with one of those bovine. ISO 200; 1/320 sec @ f / 11. With all the hurrah about the advantages of HDR photography, something I truly appreciate and enjoy doing, I thought I'd illustrate another way of accomplishing the same thing with a single image using nothing more that a series of curves adjustment layers followed by a flattening of the image. This began as a rather dark image with respect to the hillside with the trees and red rock, so much so that all you could see was a hint of a muddy dark reddish-brown blotch. Additionally, all the rock in the bottom half of the mountain was a dull bluish tone that revealed litle detail. By making an overall curves adjustment to lighten the image, and then masking out the area which I didn't want affected, I first brought out the detail in the trees and red rock. Then that approach was repeated to affect the snow that needed brightening as well as the gray rock at the bottom of the image. I then switched opacity levels and darkened the rocks just a bit to add additional detail. Finally a third adjustment was made to bring out the detail in the base of the mountains again masking out those areas that didn't require the assist. The result is quite close to what you would achieve when employing HDR software but with having to purchase that software. Plus you have the advantage of not creating something that doesn't look real when real was your goal. All very simple and easy although it does require a bit more work and concentration than does simply letting the software do it for you. ISO 400; 1/320 sec @ f / 13. Yesterday we looked at an image that was designed to mimic what you can do using HDR software without having any such product. 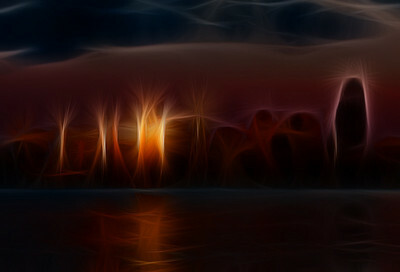 Here is another from the same series, this time shot with the idea of creating an HDR image using HDR software. The image was created using three differet shots, one exposed as the camera thought proper, another two stops under exposed, and a 3rd two stops over exposed. The software used was HDR efex Pro from nik software, costing $80, and it is a plug-in to Photoshop which you also must purchase and which was what I used to work the single image I shared yesterday. Now the question one must ask is whether or not it is worth the extra $$ to get the result you see today. It is much quicker to be sure, and offers many cookie cutter solutions that require nothing more than the click of a mouse button, but the bottom line is, is this a significantly better image than what I sent yesterday. If time is money, then it is certainly worth the additional cost, but if one is not producing material for a living, it becomes a fair question. You decide. ISO 200; 1/320 sec @ f/16 for the right on exposure. A break in the HDR comparisons for today but more will be forth coming for those of you who may be interested in seeing how the different programs compare. I'll use similar shots for the comparisons. Since I have been sharing with you a series of images taken from the Mt Baker/Mt Shuksan trip early last fall, I thought you might like to see a small overview of the area showing just a few of the group of tiny lakes called collectively The Chain Lakes. You can hike along these lakes for quite a distance, and the sights you will see while doing the walk are something quite memorable. 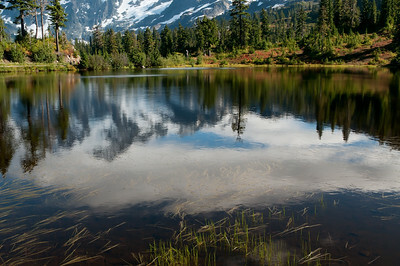 It is an easy place to hike, as long as you remain basically parallel to the lakes, but there are connecting trails that are capable of providing for a nice workout should you so desire. At the top center of this image (12 o'clock) you will note a small gray roof, the top of The Firs retreat center where we stay when we participate in the now apparently NWCCC annual Mt Baker retreat. I've been 2 of the last 3 years and will go again this year, hopefully with a guest who is on this mailing list. The lakes continue along both ends of what you are seeing, but from the position from which this shot was taken they are not visible. 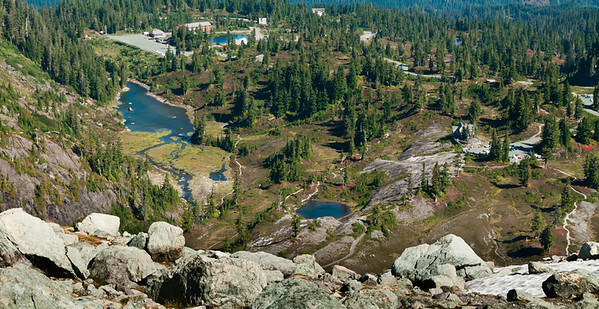 Picture Lake is out of view and sits right next to The Firs lodge at the top of the photo. If you live in my part of the woods, and haven't yet visited this wonderful area, you owe it to yourself to pay it a visit anytime of the year, but for me, the best time is in the fall. ISO 400; 1/125 sec @ f / 13. I had the opportunity Wednesday afternoon/evening of leading a Seattle Mountaineers Photo Committee photo shoot to capture the full moon rising over the downtown area of Seattle from West Seattle. 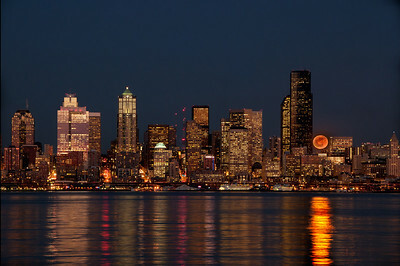 The moon is full over the city looking easterly in Jan and southerly in June when we shoot from Kerry Park. The group was comprised of roughly 10 folks from the Mountaineers but a few others joined us to inquire as to how best to shoot the scene. We got there early enough to witness and enjoy the sun setting on the architecture of the city for which it is rightly known. We shot the sunset for the better part of 90 minutes before being romanced by a most lovely orange moon. Shortly before the moon arose one of the members inquired why we started so early if we were there to shoot the moon. About 20 minutes after asking the question he got it answered when the setting looked about like this image. I've intentionally over used the noise reduction tools on this image, shot just 15 minutes prior to moonrise, to make for an artistically softer image as it is the shape and color I want to emphasize, not the specific minute details of the buildings, although they are sharply there in the original. ISO 200; 1/6 sec @ f /10 on a tripod. Well, my eight little coughing, sneezing, spitting, cherubs finally got their revenge and over whelmed the immune system big time. Got awfully cold Wednesday night at the moon shoot and didn't quite understand why until Thursday morning, and boy, did I ever then. So not much accomplished from then until this evening. Drug through class and missed the Thursday evening shoot as well. So that's my sorry excuse for no image on Friday. But we pick back up today with what we went to shoot in the first place, something other than just buildings. As everyone was waiting and shooting the light show on the front of the buildings, the moon quietly snuck up on us and made a sudden appearance. Peaking out from behind the building on the left, it began it's arc up and over the city skyline presenting us with an almost harvest moon orange color. As soon as it made its presence known all you could hear was oohs and awes and the clicking of shutters. All in all, it wasn't a bad performance, although it could have be drastically improved had the early cloud layer bothered to stay a round long enough to provide some texture and contrast for the sky. Unfortunately, it didn't, but we still enjoyed a rather nice evening shoot. ISO 200; 1sec @ f / 11 for the city shot, 1/40 sec @ f /11 for the moon. I have never been a fan of the movies, and as proof I guess one could say that my having been to the movie theater 4 times in the last 35 years would serve as proof. Even as a kid I really didn't have a big fascination for the silver screen. The only exception to this was my Jr Hi years when I was part of the Noon Movie crew who showed 10 minutes of a movie each day during the lunch period. The entry cost to see the day's showing was $0.02, and by the time you had spent $0.30 you got to see a full featured movie. Now most of these were B rated thrillers like Godzilla does Los Angeles, or something of equal intellectual value, where there was a peak moment of excitement every 10 minutes or so and at which point, or more truthfully just moments prior, we could shut off the show requiring a return on the next day to see what happened. This was back in the days of the old carbon arc movie projectors whose light was provided by the burning of two carbon rods which not only produced the light but a lot of heat, so much so, that it the movie was stopped without the light gate being closed, the acetate would immediatly melt. Occasionally though we got to show a movie of reasonable value, and one I did see in the theater, and I believe we also showed at school, was "On The Beach", a 1959 adaptation of Nevil Shute's book about a nuclear holocaust set in Australia. A very well done movie which addressed the reality of an all out nuclear war. As I was working with some of the images taken at the moonrise shoot, this story came to mind and with a bit of meddling and some small amount of thought, I came up with my version of the nuclear holocaust. Obviously an image of the creative type, I share it as the first one of this type for the new year. ISO 200; 1/60 sec @ f / 5.6. Let's leave the moonrise for a bit and take a look at an image I sent out a couple weeks back but at that time it was in an altered form. 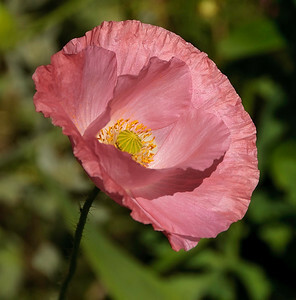 Here is the basis for the creative "memorial day poppy" that you may recall was vivid red with a yellow center. If you still have it you may want to compare. If not it has no impact on what I'm sharing today. Depending on your perspective, this is either a close up or a macro shot, and I would consider it a close up, but the terminology is not important. One frequently employed technique for displaying flower photography is to place the image behind something creative such as frosted glass or rippled glass or anything else that gives it some form of a textured look. One could also place the flower in front of translucent textured material in order to keep the flower sharp while blurring out the background. Of course one could always do the same by applying a Gaussian blur to the entire image and then masking out the portion that you wanted to keep sharp. Here is yet another approach which I've employed in this image. To get the background to drop out, I've added noise (think grain) to the image and then masked out the portion of the flower I want to keep sharp. Not necessarily a better way than the others, just another tool in the chest for when you might like to try something a bit different. Like moving to a high ASA film in the good old days, but with far greater control. ISO 200; 1/1600 @ / 8. After having been in discussion for almost 8 months, it has been determined that I will be teaching a class in Beginning Digital Photography at the local school where I am still doing a long term SPED sub job. The class begins tomorrow afternoon and I just now got the class roster: 19 students, and, oh by the way, some are low income and likely won't have a camera. And I thought the sub job was a challenge . . . . . Of course there is already a syllabus ready to go based on the concept that those taking the class would be looking for something serious. For the past hour I've been pondering about the best way to proceed and decided I'll just plunge them into the deep end of the pool and see who surfaces. Taking a Daily Image approach, image and discussion, it may just work out O.K. 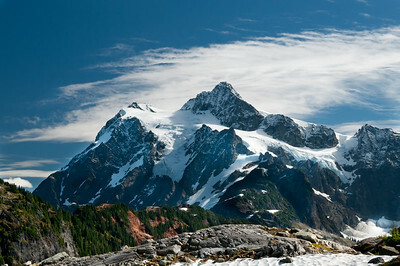 Last week I shared a couple of images from the Mt Baker area in which I discussed some HDR approaches. Just to prove that such an approach isn't always necessary, here is another image from that same series only this time the only alteration I've made was to take out a very offensive traffic sign that doesn't need to be there anyway. And I even left in a couple humans to be very different. On this trip I never could find a wind free moment and was unable to get the lake surface totally still so I went with a slight ripple approach hoping that what the image lacked in mirror like quality could be replaced by a bit of texture. The one advantage of this approach, if there is one, is that one tends to not feel the need to show the entire mountain and an equal amount of its reflection which generally results in a mirror image split equally in half which in truth is somewhat boring but done all too frequently. With the ripple effect folks tend to not feel the need to show equality and such is the case with what you have today. ISO 200; 1/250 sec @ f / 10. Well, I had a roster of 19 students, 17 showed up for the first of what is now 8 vice 10 sessions, and 2 elected to leave their class materials behind. Of the 17, 13 have cameras, and one wonderful colleague offered up 4 small point 'n shoots to fill in the void. So it looks like we are off to a reasonably good start. Of course I had to explain to a couple intrepid students that cells phones, texting, and iPods were NOT part of the class. Unlike my normal group, they immediately complied. Musta scared 'em. We went over the expectations, the basics of a camera, and looked at a "few" examples of what I thought constituted a relatively acceptable image, and why. By then there were a handful that were eager to start shooting immediately, and who were a bit disappointed that there wasn't an initial assignment. There was of course, but it was study. After class I headed out but wound up chatting with a couple other staff members. By the time I left the building the sky was turning a beautiful pink, so I grabbed a few parking lot photos of the sky, then headed to Sunset Hill Park. By the time I arrived the sunset was just about peaking and truly something to behold. I spent about 10 minutes shooting it and then it was all but over. The light was low when I arrived, and continued to decrease as I was shooting, so not having a tripod with me, switched to a high ISO and shot away hand held. The high ISO provided for a lot of noise which was to prove useful for effect in the images. One of them is what you see today, taken at the climax of the show. Now since the tools of noise reduction are really nothing more than careful blurring, I used a LOT of noise reduction to smooth out the sky portion of this image (made a selection of just the sky and applied the noise reduction to just that) and then inverted that selection to isolate the water portion and applied just a bit of noise reduction to that as I wanted to keep a fair amount of noise for texture. 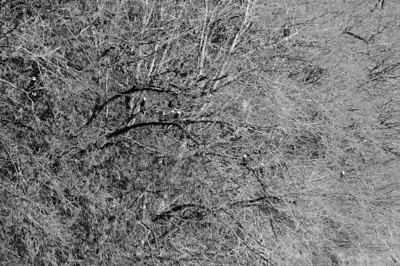 Then I applied a very tiny amount of a curves adjustment to slightly increase the contrast, with the result being what you see. ISO 800; 1/60 sec @ f / 5.6. To make up for the missed image last week, I'll send out another tomorrow taken just 55 seconds later than the one you see now. As I mentioned yesterday, Thursday's sunset was absolutely stunning, not only for the short duration of blazing color, but for the amazing display of color change in that short 10 -15 minute display. The image you have for today was taken 55 seconds after the one I shared yesterday. Once again it was shot at a high ISO which gives it some nice texture which I've removed via severe blurring (noise removal technique) for the sky and left in for the water. 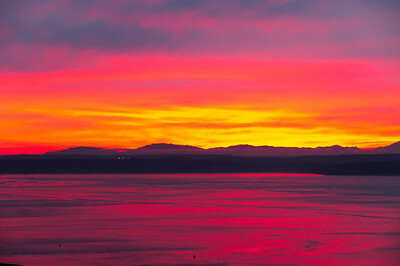 It isn't often that I've seen Puget Sound painted in pastel pink, in fact, this is the only time in my life I've seen it, so I was a bit fascinated by what I was privileged to observe last evening. 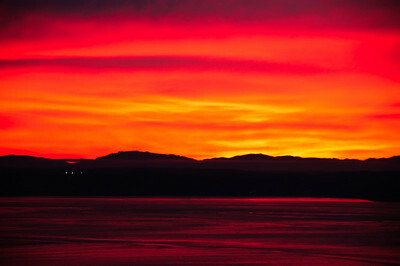 Do take a moment to view the images side by side and try to appreciate such a drastic transition in less than a minute. ISO 800; 1/30 sec @ f/ 5.6. Living as I do stuck between two major mountain ranges and a large body of open water, the opportunities for shooting something of grandeur is generally available within either walking distance (Sunset Hill Park for example) or by auto in short distance (Kerry Park) or long distance (any of the mountainous areas). Of course one must orchestrate such opportunity with the weather and find the appropriate subject based on either ones inclination, ability, or both. Wednesday and Thursday of last week provided some spectacular sunset opportunities (the last two images I sent), and true to form, two days of good weather was really asking far too much so Friday and the rest of the weekend made up for it. 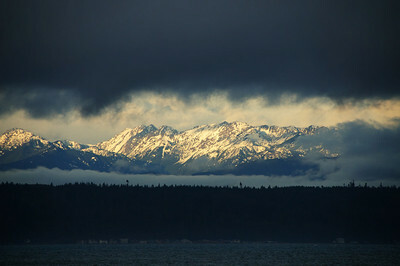 But I got out on Friday to take advantage of the truly ugly weather, and taking a lead from my frequent classroom portable view of the Olympics in the morning, made a jaunt up Edmonds way to shoot the Olympics from a different perspective. 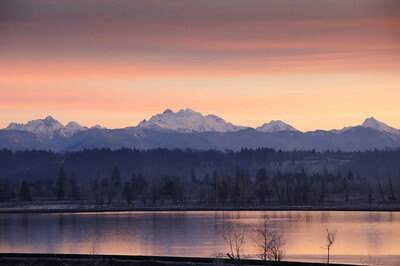 The frequently provided beautiful view of the morning light striking the tops of the Olympics was this day being channeled through a hole in the clouds, and almost struck me as an example of God painting with light, using the sun to illuminate the mountains, much as we mortals like to do with portable lights and lesser subjects. There was even a bit of morning ground fog tossed in for interest. ISO 400; 1/800 @ f /5.6.